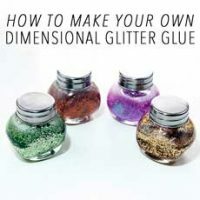 Today I’m going to share with you guys, my little tip for Valentine’s Day Flowers, or really any Flowers, that you might get for any occasion! Here we have the typical bouquet of Roses, that many of us get on Valentine’s Day. 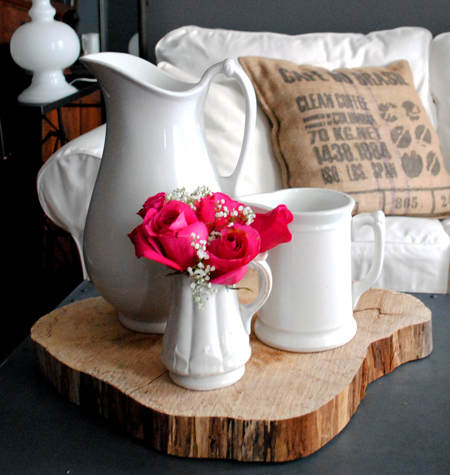 I used to pop the Roses into a tall vase like the one above, a fairly traditional look. I never thought it did the Roses justice though, as they have that “plunked in” look … not very interesting. 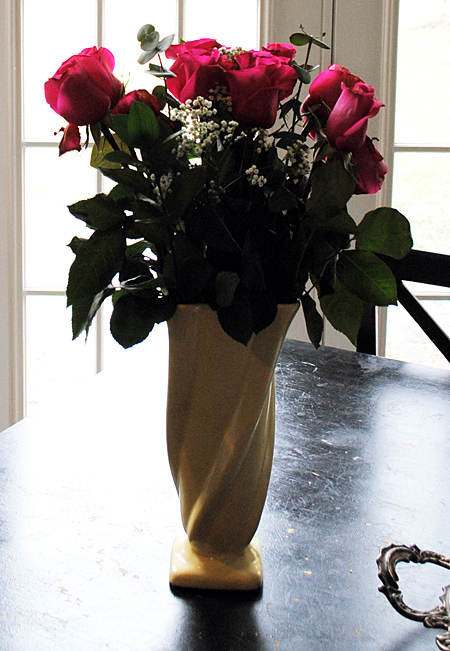 And usually in a short amount of time, the Roses would start to droop and lean over the vase. Several years ago I started cutting my bouquets down. The first time I did this my husband had a horrified look on his face, watching me chop away at the gift he had just given me! We both liked the results though, and it no longer phases him at all! 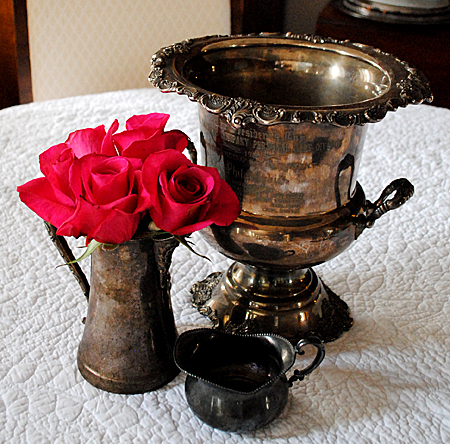 I like to use Antique containers for my mini bouquets… small pitchers are especially nice! Here I’ve used an old silver plate pitcher. 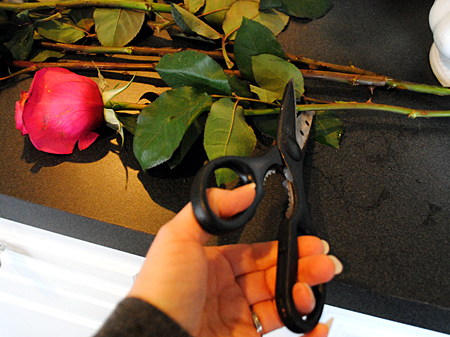 In order to cut the flowers down, I use florist scissors and cut the first one until it fits into the vessel just right. Then I use that first flower as a measure for the others. Cutting them all to the same size. I also remove the leaves. I like to pack them in pretty well. You can also cut the filler flowers down, like these Babies Breath, and add them as well if you like. I think these little arrangements look so much more charming, then the big one! Also, the flowers are packed in so tightly that you don’t get that drooping effect. And as an added bonus, you have 2 bouquets to display in your home, instead of one, so you can place them in different rooms, and get more mileage out of those pricey Roses! 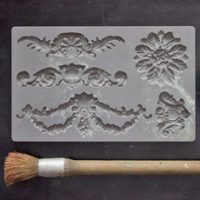 Casting DIY Appliques – Embellish Everything! 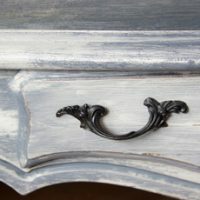 Make Your Own Dimensional Glitter Glue Weathered Furniture Finish – Rustic Farmhouse Charm! Oh and I love the Babies Breath with them. So pretty! Thanks Nancy!! 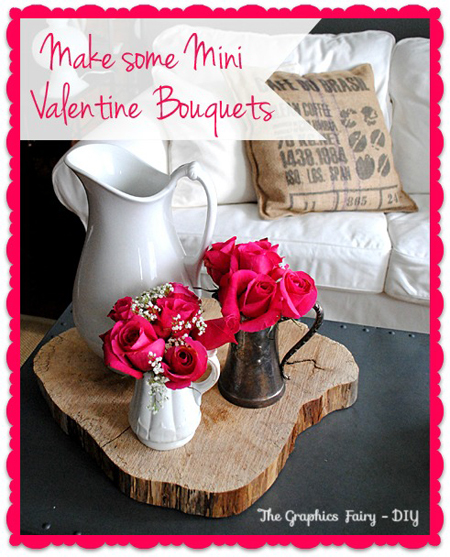 It’s super easy too, I’m not good at flowering arranging at all, so if I can do this, I know that anyone can! Great idea! They look beautiful! Very shabby, Karen. I love it!! And we get to use all of our pretty containers that we don’t get to use very often. TFS.